ATHENS, Ga. – Georgia freshman tailback Nick Chubb has earned the Southeastern Conference Freshman Player of the Week for the fourth time following the Bulldogs’ 34-7 blowout versus No. 9 Auburn, according to a league announcement. Chubb has garnered the SEC Freshman Player of the Week award four times this season and was named the SEC Offensive Player of the Week following the Arkansas win. This marks the 12th SEC weekly awards this season for the Bulldogs. Junior tailback Todd Gurley has been named the Offensive Player of the Week twice, senior inside linebacker Amarlo Herrera and senior STAR Damian Swann have each been named the Defensive Player of the Week once, freshman tailback Sony Michel has also been named the Freshman Player of the Week, freshman OLB Lorenzo Carter has earned one Defensive Lineman of the Week award and freshman Isaiah McKenzie has earned the Special Teams Player of the Week honor once in addition to Chubb’s honors. Chubb, a tailback from Cedartown, Ga., became the 12th Bulldog in school history to reach 1,000 yards rushing in a season with his performance against the Tigers. Chubb finished with 144 yards on 19 carries and two touchdowns and hauled in two catches for 48 yards. Currently, he is second in the SEC in both yards per game (103.9) and total rushing yards (1,039) in 2014. Chubb became the first Bulldog to lead Georgia in rushing and receiving in the same game since Todd Gurley did it in the 2014 Gator Bowl. Chubb scored his eighth rushing touchdown on a 4th-and-1 situation from the Auburn 9-yard line at the 8:48 mark in the second quarter to put Georgia up 14-7. He later scored his ninth rushing score on an 11-yard run in the final period. 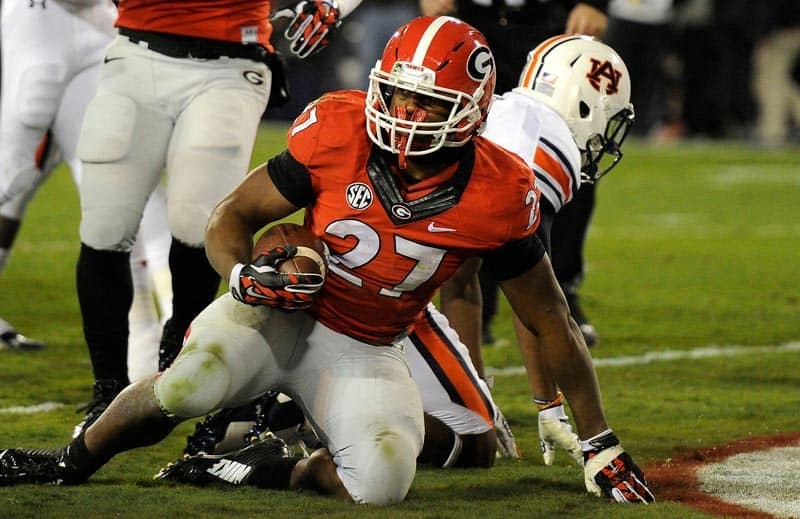 In the last five games, Chubb has 815 yards on 121 carries (6.7 yds/carry) and seven rushing touchdowns. The Bulldogs have gone 4-1 during that stretch, including beating #23 Missouri and #9 Auburn by a combined score of 68-7. The No. 9 Bulldogs (8-2, 6-2 SEC) play host to Charleston Southern (8-3, 3-2 Big South) in Athens, Ga., on Saturday, Nov. 22, during the teams’ first ever matchup. The SEC Network will televise the game at 12 p.m.